Keeping lips protected from wind, sun, and harmful UVA and UVB rays can be a challenge. For those seeking superior lip protection, Jack Black Intense Therapy Lip Balm is a premium solution. This high-quality, emollient balm is enriched with superior skin conditioners and antioxidants and has been carefully balanced with certified organic ingredients to soothe and relieve dry, chapped, and irritated lips. Unlike waxy sticks, Intense Therapy Lip Balm quickly penetrates for instant relief. It carries a SPF 25 rating and offers optimum sun protection, while guarding against windburn and extreme temperatures. 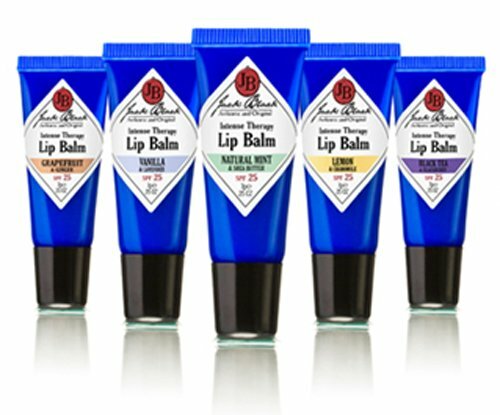 Jack Black Intense Therapy Lip Balm is packed with certified organic ingredients that work together to protect your lips from exposure to the elements. Its lip protection is enhanced with UVA and UVB absorbers avobenzone and octinoxate. Petrolatum is an FDA-approved skin protectant that is a highly effective moisturizing agent that forms a protective barrier, preventing water loss and acting to repair chapped, damaged skin. Shea butter and avocado oil are natural emollients that provide superior moisturization and conditioning. Vitamin E is known as an antioxidant superstar that works to protect cells against free-radical damage, while green tea provides anti-inflammatory properties to offer an additional layer of protection. All Jack Black products are carefully formulated with the finest ingredients to be highly effective, yet easy to use. Every Jack Black product is dermatologist tested, paraben free, cruelty free, and free of harsh surfactants. Almost all of the products in our line are vegan, free of artificial colorants, safe for sensitive skin, and made in the USA. For best results, apply Jack Black Intense Therapy Lip Balm generously and evenly to lips 30 minutes before going out in the sun, or whenever they feel dry or chapped. Enriched with superior skin conditioners and antioxidants, this emollient balm soothes and relieves dry, chapped, irritated lips. Unlike waxy sticks, it penetrates quickly to provide instant relief. Offers broad-spectrum sun protection with an SPF of 25; Also guards against windburn and temperature extremes. Colorant-free. Dermatologist tested.